Every Catholic marriage finds a firm foundation in the rosary. 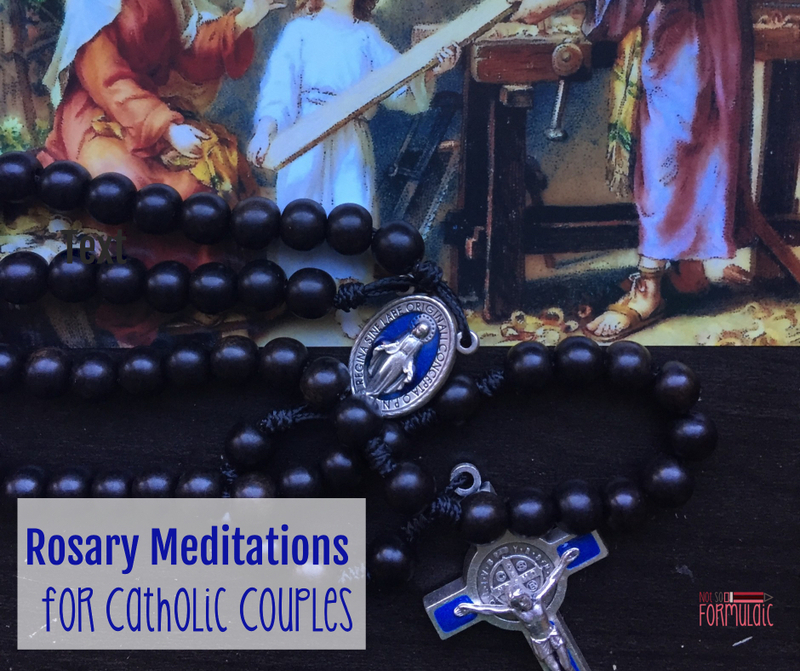 I’m pleased to offer you these Rosary Meditations for Catholic Couples, along with a review of a custom rosary from The Catholic Woodworker. This post contains a review of a custom rosary from The Catholic Woodworker. I received a rosary in exchange for this review. All opinions are my own. My sister got married in a lasso, and I’m lucky she didn’t take off my head. Not one of my shining moments. If you’re unfamiliar with el lazo (and clearly, I had no clue), it’s a beautiful wedding tradition popular in Mexican, Filipino, and Spanish communities. 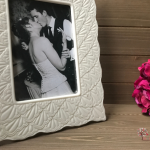 Once the couple has recited their vows, the Maid of Honor and Best Man encircle the couple in a large double rosary, symbolizing Our Lady’s blessing. The priest says a short prayer begging Our Lady’s protection, and the couple remains in the lasso until the end of the ceremony. Despite my less-than-stellar reaction to the existence of this tradition, I was honored to take part in something so meaningful. What a blessing it was to wrap Our Lady’s protection around my sister and her new husband! 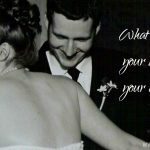 I often think back to that moment and its significance, connecting it to my own married life. Our marriage hasn’t been easy. There have been times we’ve both wanted to quit. 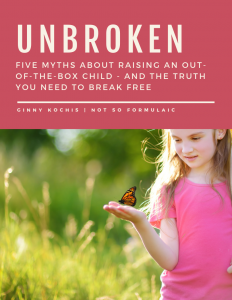 But the beauty of the rosary – most especially it’s role in preserving the sanctity of marriage – has made a huge difference in the strength of our bond. We’ve prayed the novena to Our Lady, Undoer of Knots. We’ve done the 54 Day Rosary Novena. We’ve done two decades in the car before a meeting. We’ve done a quick decade before bed with the kids. We aren’t perfect by any stretch of the imagination. I can pinpoint several moments in our marriage when we should have turned to Our Lady’s intercession, and didn’t. But to us, the future of the Church rests in the sanctity of Catholic marriage. Our union is our domestic church. The rosary helps us build it. Our union is a model of the Holy Family. The rosary helps us own it. Our union is a model of Christ’s sacrifice on the cross. The rosary helps us embrace it. 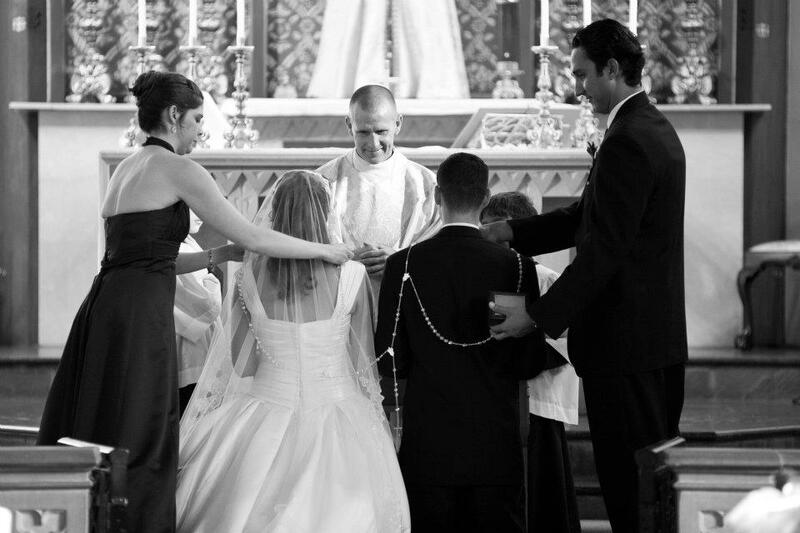 The rosary is integral to the sanctity and growth of Catholic marriage. Here’s how to keep it at the center of your home. I mentioned previously we’ve done the novena to Our Lady, Undoer of Knots and the 54 Day Rosary novena. Both of them are intensely powerful prayers, and I highly recommend them as a means to strengthening your marriage. One of the reason I love Instagram is the connection I’ve made with Catholic artisans. 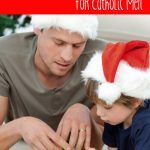 I met Jonathon Conrad of The Catholic Woodworker a few months ago, and I worked with him to create the custom rosary featured in the images for this post. I was able to choose the color of the beads, the metal used in the findings, and the color and content of the medal and the cross. 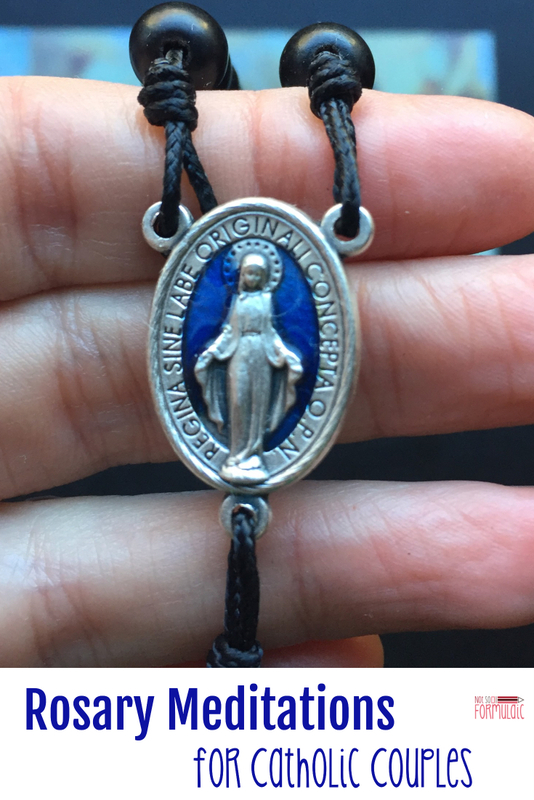 I ordered a beautiful St. Benedict medal rosary for my husband; it arrived in a handsome satchel accompanied by a prayer card and blank journal. My husband loves it, and he’s been carrying it with him every since. The Annuciation – Humility: Lord, show us how to pray as a couple. Let us be beggars in Christ. The Visititation – Love of Neighbor: Lord, we are one in you. May our union be a symbol of Your love for Your Church. The Nativity – Detachment: Guide us, Lord, as we cling to you. Let us find comfort in the fruits of your spirit, not in material goods. The Presentation – Obedience: Mold our hearts to yours, oh Lord. Through our submission to one another, may we be submissive to You. The Finding of the Child Jesus in the Temple – Piety: Lord, we dedicate our marriage to You. We commend our union to Your grace and Your Church. The Baptism of the Lord – Openness to the Holy Spirit: Lord, the health of our marriage depends on You. Open our hearts to the wisdom of your Spirit. The Wedding at Cana – To Jesus Through Mary: You instructed the guests at Cana to do whatever she told them. Instill in us a desire to do your will, through your blessed Mother. The Proclamation of the Kingdom – Repentance, Trust in God: Lord, turn the heart of our marriage away from sin. Lead us to trust in you alone. The Transfiguration – Desire for Holiness: Bless our marriage with the desire for holiness. Let us long to be united with you through our union with one another. The Institution of the Eucharist – Love of our Eucharistic Lord: Let the foundation of our marriage be the Eucharist, O Lord. May we endeavor to find you in the Mass and frequent reception of the Sacraments. The Agony in the Garden – Contrition, Conformity to God’s Will: Forgive us, O Lord, when we have strayed from your guidance. Let our hearts always long for what you want. The Scourging at the Pillar – Mortification: Sometimes we annoy or irritate one another. Let us offer these irritations to you, O Lord, rather than build up resentment or anger. The Crowning of Thorns – Moral Courage: Lord, we live in trying times. Grant us the courage to live our faith out loud, to preserve the sanctity of marriage and the family. The Carrying of the Cross – Patience: Lord, we are not always patient. May we develop the grace to wait for you, to desire all things in your time. The Crucifixion – Self-Denial: Our union bears the fruit of total self gift. 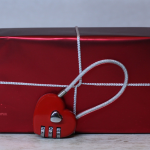 Help us to offer even the smallest tasks as a gift to one another, and you. The Resurrection – Faith: We do not often know what direction we should take, Lord. Strengthen our faith and our trust in you. The Ascension – Desire for Heaven: Lord, we desire union with you in heaven. May we lead one another to your Sacred Heart. The Descent of the Holy Spirit – Wisdom: We are faced with many challenging decisions, Lord. Grant us wisdom, fortitude, and right judgment. 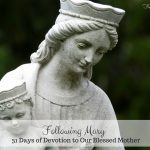 The Assumption – Devotion to Mary: Strengthen our devotion to Mary, your mother. Let us long to seek to model her perfect love. The Coronation – Eternal Happiness: Lord, we long to share to live with you in Paradise. Grant that our union to one another will bring us to union in you. The tradition of the lasso highlights an important aspect of Catholic marriage. Every decision you make as a couple needs to be rooted in prayer. As we work toward rebuilding a culture of life and evangelization, there’s no better way to achieve it than with the support of the holy rosary. This is so beautiful! It’s amazing how marriage can get the last place on the list. As well, it might be the hardest one to show that merciful love. But with Mary, it is all possible. We had the Lasso, a very beautiful tradition and it means a great deal that rosary to me. It is also for use to have the tradition to walk down the aisle with a rosary and boutique of flowers. My husband to be, surprised me the night before with antique rosary he bought for me. 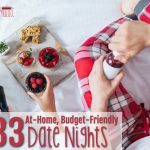 Relatable meditations and good examples of incorporating the Rosary into your everyday married life. Thanks for the encouragement, reminder, and gentle nudge.